Other Products by Finaflex. Search other Pre-Workouts products. Boost Squat, Leg Press & Bench Press Performance! You've probably heard of neurotransmitter before. These little chemicals are released by neurons in order to communicate with other neurons in the brain. This is an integral part of how the brain functions, which is primarily composed of neurons. One very important neurotransmitter is called dopamine. Dopamine is important for supporting mood and also reducing addictive behaviour (like food addictions!). Finaflex Stimul8 Loaded actually contains a dopamine enhancer, called Theacrine (TeacrineR)1. This is a natural compound that supports dopamine signalling in the brain, therefore assisting with increased mood. Caffeine is also included in Finaflex Stimul8 Loaded, not only as a stimulant and mood booster, but also to enhance Theacrine bioavailability. In addition, Finaflex Stimul8 Loaded contains L-Theanine, a specialised amino acid found in green tea that supports alpha brain wave activity2. This enhances mental calmness, whilst maintaining alertness, which helps to reduce some of the jitteriness and over-stimulation to the nervous system that can occur with caffeine supplementation. Each serve of Finaflex Stimul8 Loaded contains two powerful nitric oxide enhancing amino acids called citrulline malate 2:1 and agmatine sulfate. These have a synergistic effect in the human body, supporting nitric oxide production and the delivery of nutrients to muscle tissue, as well as the removal of waste products, like lactic acid, during exercise. Citrulline malate is an excellent pre-workout aid, with research indicating that it can boost bench press and leg press volume, whilst reducing delayed onset muscle soreness3,4. It is believed to do this by increasing blood arginine levels, which is the precursor (building block) used for nitric oxide production. Agmatine, is quite a potent little amino acid, even when used in smaller doses, as it has been shown to enhance activity of an enzyme called nitric oxide synthase. This is the enzyme responsible for synthesizing nitric oxide, the gas that relaxes smooth muscles in blood vessels, thus allowing dilation, and more blood to be pumped—with each contraction of the heart—to muscle tissue. This helps to magnify muscle pumps as well. 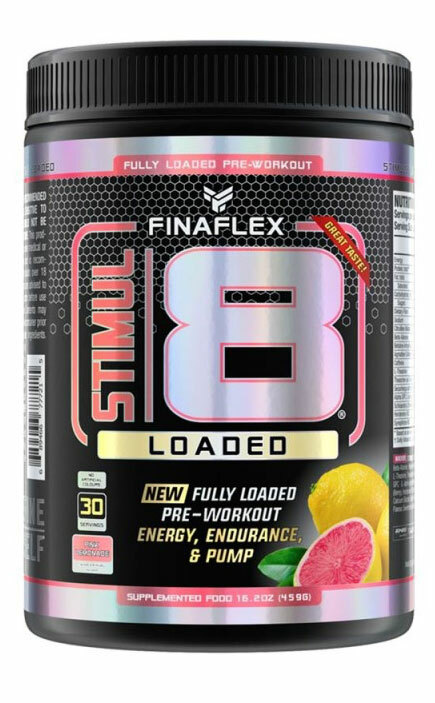 The Finaflex Stimul8 Loaded formula also contains Betaine Anhydrous, also known as trimethylglycine, which has been shown in clinical trials to increase arm size (if that's your thing), bench press volume, boost power, improve body composition and squat performance5,6. In fact, there are many many more natural performance anhancing and scientifically validated ingredients in Finaflex Stimul8 Loaded. So if you're ready for change the way you train, and the way you feel when you train, Finaflex Stimul8 Loaded is certainly the pre-workout for you. Mix 1 Serve (14.9g) with 250-450ml cold water and consume immediately. To assess caffeine tolerance, begin with 1/4 to 1/2 serve and take before lunch. 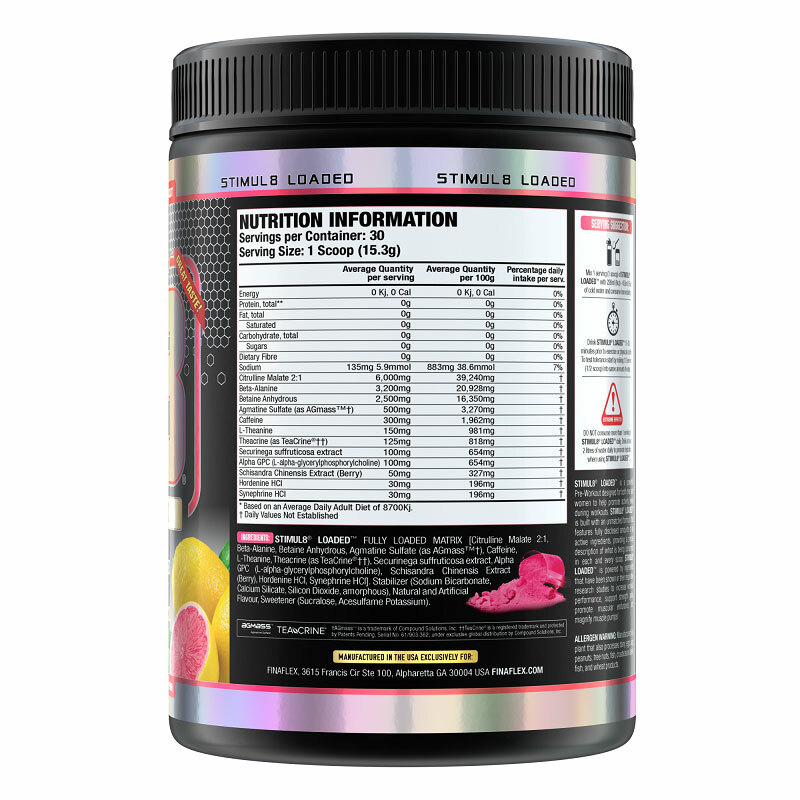 INGREDIENTS: Stimul8R LoadedTM FULLY LOADED MATRIX [Citrulline Malate 2:1, Beta-Alanine, Betaine Anhydrous, Agmatine Sulfate, Caffeine, L-Theanine, Theacrine, Securinega suffruticosa extract, Alpha GPC, Schisandra Chinensis Extract (Berry), Hordenine HCL, Synephrine HCL, Stabiliser (Sodium Bicarbonate, Calcium Silicate, Silicon Dioxide Amorphous), Natural and Artificial Flavour, Sweetener (Sucralose, Acesulfame Potassium). Have been using this product for 3 years. Have it for breakfast - have intolerance to wheat and grains. Have never reacted to it.